Age 65, died October 2, 1993 at Atlantic General Hospital of heart failure. 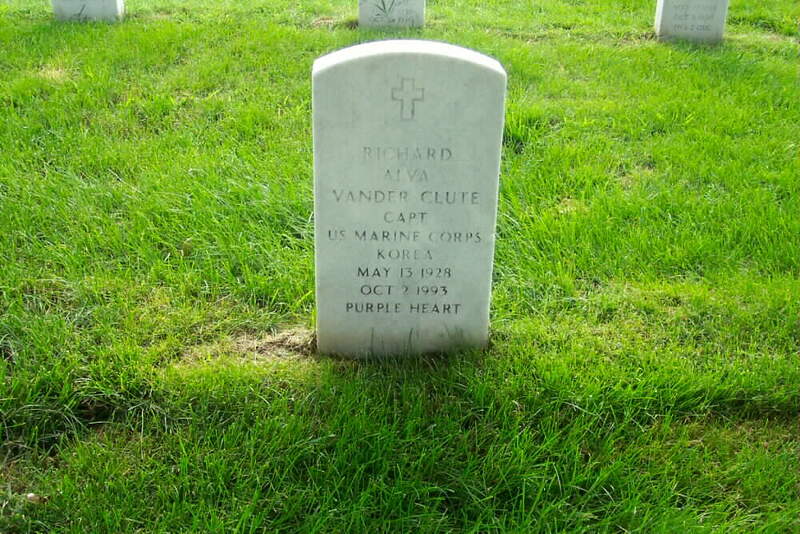 Captain Vander Clute was born at Valley Stream, New York, the son of the late Alva R. Vander Clute and Beulah McKinnon Vander Clute. He is survived by his wife, Dorothy Alice Vander Clute and 2 children, a son, and daughter. There are 4 grandchildren. He had been a Marketing Manager with UNISYS Corporation, computer firm in Great Neck, New York. He attended Colgate University and Wake Forrest University, and was a member of the Northport Yacht Club in Northport, New York, and was United States Marine Corps veteran who served in the Korean War and who was a recipient of the Purple Heart Medal. A funeral service will be held Tuesday evening at Burbage Funeral Home in Berlin at 7 pm. Family will receive friends from 7:30 to 8:30 pm at funeral home Tue evening. Another funeral service and interment will take place later in week at Arlington National Cemetery. Donations may be made to ALS Foundation, 20121 Ventura Blvd, Suite 321, Woodland Hills, California 91364. He was buried on Friday, 8 October in Section 60, Grave 5792.